U.S. gold rallied above $1,472 an ounce on Thursday, less than $2 from its all-time closing record. Silver prices soared 3.5 percent and closed to a fresh 31-year high at above $41 an ounce. Among the factors analysts cited for precious metals gains included weaker-than-expected U.S. jobs data, inflation worries as U.S. producer prices rose, a falling U.S. dollar and renewed concerns over Greek debt. June gold prices advanced $16.80, or 1.2 percent, to settle at $1,472.40 an ounce on the Comex in New York. Gold ranged from $1,453.20 to $1,475.20. Gold has risen 3.6 percent in 2011. "The weekly jobless claims report came in weaker than expected and the U.S. producer price index had a core reading that was a bit hotter than expected," said Jim Wyckoff of Kitco News. "The U.S. dollar index sunk to a fresh 16-month low following the release of the economic data, which boosted the gold market bulls. The very weak technical posture of the U.S. dollar index also remains a bullish underlying factor for the precious metals markets." "The combination of higher oil prices, weaker dollar and the resurrection of discussions of Greek sovereign risk problems has galvanized the gold market. It’s particularly impressive because we ran into selling above the market yesterday," James Steel, chief commodity analyst at HSBC said and was quoted on Reuters. Silver prices for May delivery surged $1.427 to $41.644 an ounce, rising eight out of the last nine sessions and closing to its best price since 1980. Silver traded between $40.450 and $41.780. Silver prices have soared 34.7 percent this year. Platinum prices for July delivery added $18.40, or 1.0 percent, to close at $1,795.60 an ounce. Platinum ranged from $1,770.00 to $1,797.50. Palladium prices for June delivery ended up $8.95, or 1.2 percent, to $774.25 an ounce. Palladium traded between $755.00 and $775.50. 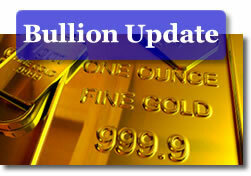 London PM fix precious metals prices were again mixed as compared to their previous PM fixings. The PM gold fix rose $8.25 at $1,465.75 an ounce. Silver prices advanced 45.0 cents at $40.670 an ounce. The platinum fix fell $14.00 at $1,772.00 an ounce. Palladium declined $10.00 at $763.00 an ounce.